The two biggest names in cable television will soon be joining forces as it was annoiced to that Comcast and Time Warner Cable are planning to merge. The "pros" of the merger are things like the "accelerated deployment of existing and new innovative products and services for millions of customers", plus making the shareholders of each company happy. The downside is that- with the two main competitors now allies- people will have few lpaces to turn for cable service should they be unhappy with the new company. The deal is expected to close by the end of the year. Comcast Corporation and Time Warner Cable (NYSE:TWC) today announced that their Boards of Directors have approved a definitive agreement for Time Warner Cable to merge with Comcast. The agreement is a friendly, stock-for-stock transaction in which Comcast will acquire 100 percent of Time Warner Cable's 284.9 million shares outstanding for shares of CMCSA amounting to approximately $45.2 billion in equity value. Each Time Warner Cable share will be exchanged for 2.875 shares of CMCSA, equal to Time Warner Cable shareholders owning approximately 23 percent of Comcast's common stock, with a value to Time Warner Cable shareholders of approximately $158.82 per share based on the last closing price of Comcast shares. The transaction will generate approximately $1.5 billion in operating efficiencies and will be accretive to Comcast's free cash flow per share while preserving balance sheet strength. The merger will also be tax free to Time Warner Cable shareholders. "The combination of Time Warner Cable and Comcast creates an exciting opportunity for our company, for our customers, and for our shareholders"
"The combination of Time Warner Cable and Comcast creates an exciting opportunity for our company, for our customers, and for our shareholders," said Brian L. Roberts, Chairman and Chief Executive Officer, Comcast Corporation. "In addition to creating a world-class company, this is a compelling financial and strategic transaction for our shareholders. Also, it is our intention to expand our buyback program by an additional $10 billion at the close of the transaction. We believe there are meaningful operational efficiencies and the adjusted purchase multiple is approximately 6.7x Operating Cash Flow. This transaction will be accretive and will yield many synergies and benefits in the years ahead. Rob Marcus and his team have created a pure-play cable company that, combined with Comcast, has the foundation for future growth. We are looking forward to working with his team as we bring our companies together to deliver the most innovative products and services and a superior customer experience within the highly competitive and dynamic marketplace in which we operate." "This combination creates a company that delivers maximum value for our shareholders, enormous opportunities for our employees and a superior experience for our customers," said Robert D. Marcus, Chairman and CEO of Time Warner Cable. "Comcast and Time Warner Cable have been the leaders in all of the industry's most important innovations of the last 25 years and this merger will accelerate the pace of that innovation. Brian Roberts, Neil Smit, Michael Angelakis and the Comcast management team have built an industry-leading platform and innovative products and services, and we're excited to be part of delivering all of the possibilities of cable's superior broadband networks to more American consumers." The new cable company, which will be led by President and CEO Neil Smit, will generate multiple pro-consumer and pro-competitive benefits, including an accelerated deployment of existing and new innovative products and services for millions of customers. Comcast's subscribers today have access to the most comprehensive video experience, including the cloud-based X1 Entertainment Operating System, plus 50,000 video on demand choices on television, 300,000 plus streaming choices on XfinityTV.com, Xfinity TV mobile apps that offer 35 live streaming channels plus the ability to download to watch offline later, and the newly launched X1 cloud DVR. Comcast is also a technology leader in broadband and has increased Internet speeds 12 times in the past 12 years across its entire footprint. Time Warner Cable owns cable systems located in key geographic areas, including New York City, Southern California, Texas, the Carolinas, Ohio, and Wisconsin. Time Warner Cable will combine its unique products and services with Comcast's, including StartOver, which allows customers to restart a live program in progress to the beginning, and LookBack, which allows customers to watch programs up to three days after they air live, all without a DVR. Time Warner Cable also has been a leader in the deployment of community Wi-Fi, and will combine its more than 30,000 hotspots, primarily in Los Angeles and New York City, and its in-home management system, IntelligentHome, with Comcast's offerings. 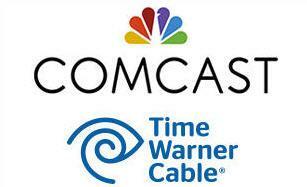 Through the merger, Comcast will acquire Time Warner Cable's approximately 11 million managed subscribers. In order to reduce competitive concerns, Comcast is prepared to divest systems serving approximately 3 million managed subscribers. As such, Comcast will, through the acquisition and management of Time Warner Cable systems, net approximately 8 million managed subscribers in this transaction. This will bring Comcast's managed subscriber total to approximately 30 million. Following the transaction, Comcast's share of managed subscribers will remain below 30 percent of the total number of MVPD subscribers in the U.S. and will be essentially equivalent to Comcast Cable's subscriber share after its completion of both the 2002 AT&T Broadband transaction and the 2006 Adelphia transaction.